The announcement Sunday by the Federal Bureau of Investigation Director James Comeytriggered dollar buying ahead of the election on Tuesday. Investors’ worries have mounted since the announcement in late October that the FBI had found new evidence in its investigation of Clinton’s emails. Many currency market watchers have expected a win by Democratic candidate Clinton, who they consider will provide greater policy clarity and less uncertainty on trade negotiations. The dollar USDJPY, +1.41% jumped about 1.4% to trade at ¥104.52, up from ¥103.10 late Friday in New York. The Mexican peso USDMXN, -2.0014% , which has been highly sensitive to developments in the presidential race, extended recent gains, leaving the dollar to buy 18.63 peso compared with 19.02 on Friday. The latest FBI comments on Sunday helped clear up market sentiment, sending U.S. stock futures soaring. Futures for the Dow Jones Industrial Average YMZ6, +1.44% surged more than 220 points on Monday. European stocks SXXP, +1.38% leapt and in Asia, Japan’s Nikkei Stock Average NIK, +1.61% ended 1.6% higher. The dollar’s gains underscores a sign of how the market has again started pricing in Clinton’s victory in the U.S. presidential election, said analysts at J.P. Morgan in the bank’s morning note. The ICE U.S. Dollar Index DXY, +0.37% which measures the greenback against a half-dozen currencies, picked up 0.7% to 97.738. The WSJ Dollar Index BUXX, +0.58% was up 0.6% at 88.05. 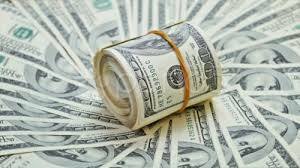 The euro EURUSD, -0.7271% softened to $1.1055 from $1.1142 late Friday. Meanwhile, the pound GBPUSD, -0.9985% was buying $1.2400, compared with $1.2518 late Friday in New York. But investors are still nervous about the potential risks ahead of the election outcome, which is weighing down on further upside for the dollar. “I think investors are becoming pretty much conservative,” ahead of the year-end book closing, said Toshihiko Sakai, senior manager of forex and financial products trading division at Mitsubishi UFJ Trust and Banking. “I can expect they won’t be able to make major moves again tomorrow,” said Sakai, noting that they will likely take positions after the results.